JCPenney Super Clearance - Arizona Boys Sneaker Just $9.74! You are here: Home / Great Deals / JCPenney Super Clearance – Arizona Boys Sneaker Just $9.74! 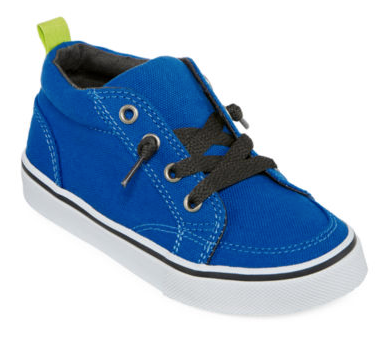 JCPenney Super Clearance – Arizona Boys Sneaker Just $9.74! Check out the JCPenney Super Clearance Sale In All Departments – Get the Arizona Boys Sneaker for Just $9.74! Marked down from $30 to $12.99 you can get them for even less by using a promo code at checkout! Our lace-up Lil Cadell sneakers will give him comfort and oh-so-cool style all in one! Be sure to use code OURFREND (Yes it is spelled that way!) at checkout to get your extra 25% off!